Piano and unison chorus on oohs and ahs. 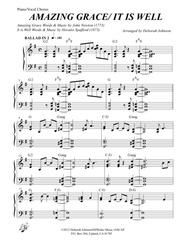 Contemporary arrangement combining these two recognizable hymns in folk/pop style with a few challenging piano arpeggios and key changes throughout. 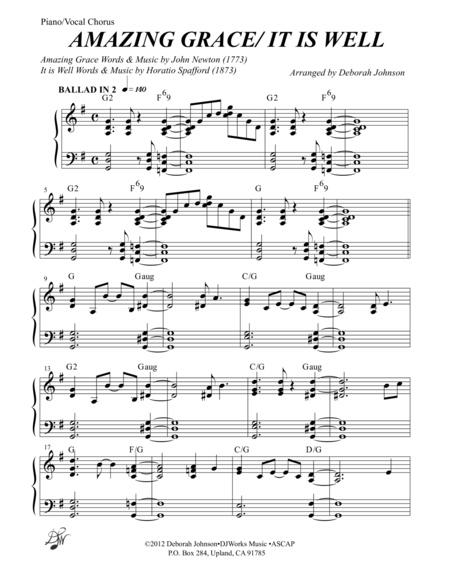 Medium difficulty and can be performed with or without vocals.From My Fathers Favorite Hymns, up for a 2012 GRAMMY Award, available on Amazon (http://amzn.to/1fSaWVe) or CD Baby (http://www.cdbaby.com/cd/deborahjohnson) by Deborah Johnson. There is also a beautiful spiral-bound devotional guide available with the amazing stories and life principles gained from these timeless classics, as well as all the music arrangements in one spiral-bound volume. Both are available on Amazon. Amazing Grace by John Newton (1773) is one of the most recognized hymns in the world, and is often thought of as a folk song. It was written to illustrate a sermon and was fairly obscure until the Second Great Awakening in the early 19th Century. The tune is to New Britain and it is performed about 10 million times annually. It is Well with my Soul, words by Horatio Spafford (1873), was written after his four daughters perished on a French liner heading for Europe when colliding with an iron sailing vessel. His wife alone was saved. Melody by Phillip Bliss, who died along with his wife in a terrible train wreck in Ohio.For more information about Deborah, her albums, books and products, visit www.DJWorksMusic.com .